Organizers say they anticipate a new 60-bed shelter in Leslieville will be operating at full capacity by this weekend. As Toronto braces for another dip into freezing temperatures beginning Friday, a newly-opened facility in Leslieville is adding 60 beds to the city's shelter capacity. The New Hope Leslieville shelter, run by the Salvation Army, opened Monday on Leslie Street between Queen Street East and Eastern Avenue. "We're thrilled to finally have it open and to welcome our first shelter to wonderful Ward 32," said Coun. Mary-Margaret McMahon, who visited the shelter on opening day and described it as "beautiful, colourful and bright." In addition to the beds, the men's shelter has programs that link clients with medical support and housing services to help them find a permanent place to stay. New Hope was created to replace the 124-bed Hope Shelter, which operated for 40 years at the intersection of McCaul and College streets and closed in 2015. "When we finally found this location, we had spent years looking throughout the city," explained Bradley Harris, executive director for Salvation Army Toronto's housing and homeless supports. The challenge, he says, is finding a building that can be renovated, fits municipal requirements, and is welcomed by the local community. Asked how Leslieville residents felt about the new shelter, McMahon said the area is "known to be very open and inclusive. "In that way, it wasn't a sell, but of course there are NIMBY's everywhere," she added. Harris says though New Hope is a relatively small space, there's room for clients to spend time there throughout the day and a dining area where they can get breakfast, lunch and dinner. It's a slightly more permanent solution than the warming and respite centres the city's homeless have leaned on through the brutal cold snap that descended on the city over the holidays. In fact, said Harris, a number of the shelter's very first clients came directly from city-run respite centres, where cots or mats on the floor are the norm. "So to be able to come into the shelter, a new shelter, a clean warm space for them … they were quite pleased," he said. 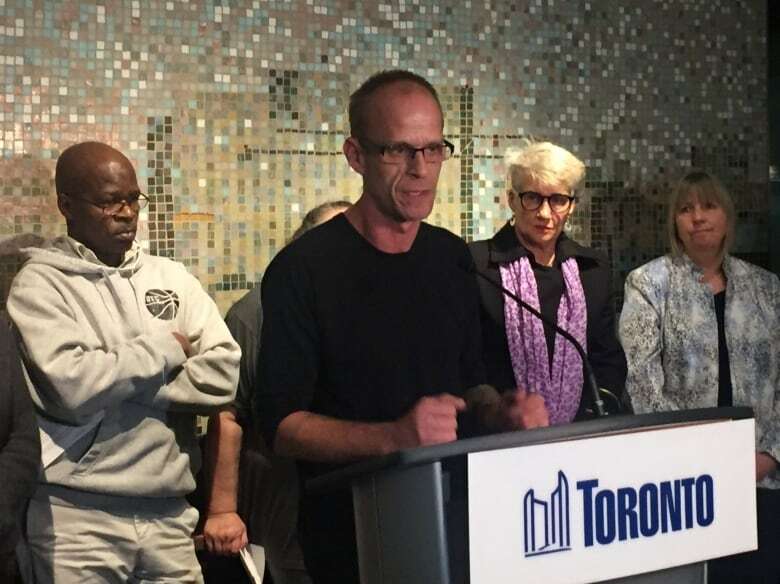 David Gordon, who has been homeless on and off in Toronto for three years, spoke out on Tuesday about the dire conditions he sees in the city's shelter system. The opening comes as calls mount for the city to do more to house its homeless and address a shelter system that operates routinely at or above a 95 per cent capacity. On Tuesday, city staff announced they are looking for a new site for a permanent shelter. They also announced that a building at 354 George St. will open Jan. 29 to replace the Moss Park armoury, which was converted into a temporary emergency shelter last week. Meanwhile,Toronto's 2018 Shelter Infrastructure Plan and Progress Report lists several other shelters that continue to seek new locations, including the YWCA's Beatrice House and Homes First.